I’ve been raving about Scout Cosmetics to my family, friends, and the blogging community for a while now. They have the nicest range of eco-luxe mineral makeup on the market, but did you know they also make organic skincare? They recently launched their Superfood skin care collection designed to nurture, refine and protect the skin. They have harnessed the power of three Australian certified organic super food ingredients which form the foundations of the brand new range, including Desert Lime, Davidson Plum & Kangaroo Apple. Before I go on with my review, please note that this gentle exfoliating cleanser also works to dissolve impurities and make-up. 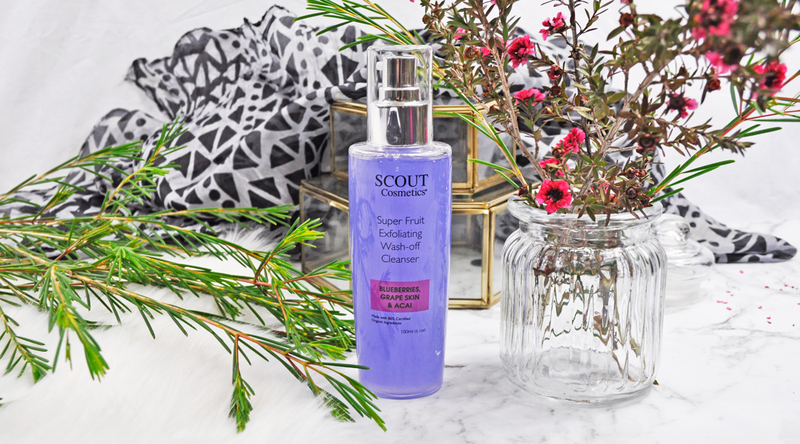 It deeply cleanses without drying or irritating the skin, so you end up with noticeably clearer skin that’s also soft and glowy. It has a gentle fresh scent which leaves behind a calming sensation, and a gel texture that lathers into a really good foam. Enriched with Organic Blueberry Extract, Grape Skin Extract and Acai Berry Oil, these great actives will nourish, revitalise and refresh your skin. Application: Two pumps should be sufficient to cleanse the face with a little water. Remove with a warm, wet face cloth. Suitable for oily, combination to normal skin. What is your favourite everyday cleanser? I’ll have to try it sometime! Me too 🙂 There is something about about citrus that is… je ne sais quoi 🙂 Love it! I love skincare containing grapefruit, I’ll have to add it to my list of products to try! I use Shiseido extra gentle foaming in the mornings. I do love a good froth! Omg Australia has some of the best natural/organic skincare products!! This is the first time I’m reading about Scout. I love the pretty packaging and it sounds amazing.